I have been part of many high, and some not-so-high, performing teams in my 32 years in the Army and 5 years in the civilian work force. I can personally attest to these seven fundamentals. 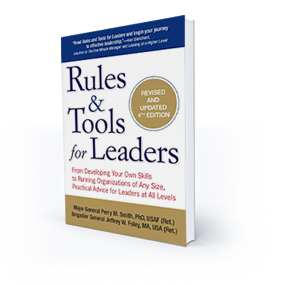 They were derived from my own experiences, combined with qualitative research by experts on leadership. Knowing and mastering them can change your world. Every good leadership book talks about getting the right people on the bus. Why? Because it is that important. Investing in recruiting people who possess the character, chemistry and commitment that fit the values and mission of the organization will have a dramatic, long term, positive impact on the organization. Applications and interviews are good starting points. There are also great diagnostic tools that can help determine if the person possesses the cognitive ability, the learning capacity and job based behaviors that match the position being considered for hire. There is value in contacting references too – often can make or break a good decision. The cost of hiring the wrong person can be extensive, especially in small companies. Together, these three components provide the foundation of an organization’s culture. The mission describes what the organization does every day – why the organization exists. A compelling vision describes what you are building, an imagined future state in which the organization creates something of unquestionable significant value. The vision must be inspiring. It is established by the CEO and the executive leadership team but ultimately shared by all as the azimuth for the future. Values are those deep beliefs that drive expectations of behaviors of every member of the organization. The U. S. Army became a value-based organization in 1998 highlighting 7: loyalty, duty, respect, selfless service, honor, integrity, and personal courage. These values help soldiers increase their sense of belonging to the team, united with a common bond. Max DePree (from: Leadership is an Art) says leaders must communicate with their people their passion for mission, vision, and values using the 3rd grade approach: “say it over, and over, and over again until they get it right, right, right.” To succeed in aligning an organization, everyone needs to be abundantly clear on the vision, mission, and values. Well defined standards and procedures describe how an organization functions on a day-to-day basis. The importance of clarifying responsibilities and aligned authorities ensures all understand who does what. When enforced, good processes enable accomplishment of mission and efficient management of fiscal resources. They ensure discipline, consistency and help create the foundation for scalability. Good processes enable synchronization among key events and actions. They help new folks get on board quickly and ensure due diligence is performed when making important decisions. An effective performance appraisal system that links personal performance to the priorities of the organization is a key element of standardization. Appraisal systems facilitate communications between leaders and direct reports enabling goal setting, measuring progress over time, and reinforcing the values of the organization. Ambiguous or missing operational standards will lead to bureaucratic stagnation, reduce the quality of products and services, hinder growth, and adversely impact the efficiency and effectiveness of an organization. If you do not know where you are going any path will get you there. Every organization needs a set of achievable objectives consistent with the vision and mission, captured in a business plan for the future. This plan needs to address what you are building (vision), why the organizations exists (mission), what results you will measure (objectives), how you will ensure your success (strategies), and what work must be done to achieve the objectives (action plans). Ideally there are timelines identified and accountabilities assigned. A solid plan helps achieve alignment in an organization and facilitates tracking results. The leadership team must put into place a process for tracking the progress of each objective to ensure good decisions are made on allocation of resources, consistent with the priorities. The plan enables all members of the organization to see where and how they contribute to accomplishment of the mission. Every member of the organization should be clear on the value of their contribution to the vision, mission, and priority objectives of the company. When the objectives are directly linked to the vision and mission, the probability of their successful accomplishment is increased significantly. An effective leader development program helps people grow, recruits new talent, and retains good people in the organization. It can be one of the most inspiring elements of your organization. It can also be one of the biggest differentiators between you and your competition. Do not just focus on the few – find ways to develop everyone from the executive team down to front line supervisors. The need to identify skill gaps and put programs in place to address these gaps is leader business and essential to achieve and sustain high performance of your leaders. These programs can also help identify mismatches between people and their jobs thereby affording an opportunity to fine-tune the organization. Effective leader development programs are even more critical during times of change, reductions in force, or reorganization actions. In these times it is critical to help people become better skilled leaders and more effective communicators with their people. Outstanding leaders do not drift to greatness – they achieve it through tireless pursuit of learning and growing. You cannot ignore this task and expect to achieve sustained levels of high performance in your organization. Exhaustive research has shown that an employee’s relationship with their direct manager is the most important determinant to employee satisfaction. Pat Lencioni (from: The Truth about Employee Engagement) highlights that employees will be “engaged” and be positive contributors to the organization when they know three things. First, they are known and appreciated by their managers. Second, they know how their work impacts the mission of the organization and lives of others. Third, their performance and success is assessed. These three key elements help build trust between people within an organization that can lead to a level of camaraderie and esprit-de-corps that is unique and special in high performing organizations. When members of an organization trust each other, a real sense of community can be achieved. This sense of community builds when people live life together, genuinely care about each other, have each other’s back, and hold each other accountable. Members of the team putting the organizations priorities ahead of their own is a wonderful indicator that something good in going on with your people. 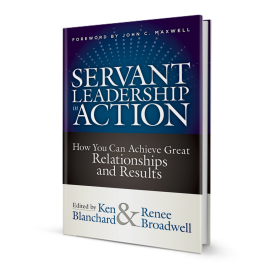 Each of the 6 fundamentals described above demand senior leader engagement and support. In addition to these fundamentals, there are clear executive level leadership responsibilities that go beyond these fundamentals. Some very important elements are provided here. Best-selling author Jim Collins (from: Good to Great) says level 5 leaders – the highest level – demonstrate an unwavering resolve to achieve long-term results while demonstrating compelling modesty and personal humility. It is the executive leader’s responsibility to communicate a compelling vision and provide the resources necessary to achieve it. Executive leaders must be committed to lifelong learning while possessing the courage to listen to others and the discipline required to cause change in organizations. The most successful leaders are those who discover what others are good at. The most effective leader/coach understands goal setting and how to apply the appropriate leadership style that best fits the diagnosed development level of their people. Leading others is not easy. But overwhelming research has shown that with competent leadership, people and companies prosper. Understanding what it takes to build and sustain a high performing organization is one thing – achieving it is another. Where does your organization stand on the above 7 fundamentals? Is your organization a high performing one? If not, why not? And most importantly, what can you do to address the areas in need of attention?